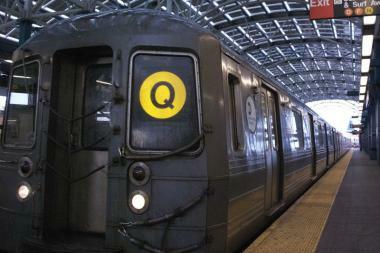 Q train service will be disrupted in Brooklyn overnight on weeknights for two weeks. BROOKLYN — Overnight Q service will be disrupted in Brooklyn for eight weeknights while the MTA does repair work. Trains will not run in both directions between the Atlantic Avenue-Barclays Center and Prospect Park stations from 10 p.m. to 5 a.m. between Sept. 11 and 15 and again from Sept. 18 to 22, according to the agency. Free shuttle buses will provide alternate service and pick up passengers at the Seventh Avenue station. Q trains will also bypass the DeKalb Avenue station in both directions between 10:30 p.m. and 11:30 p.m. on those dates. Brooklyn-bound B trains will terminate at Atlantic Avenue after 10 p.m.
Service will run in two sections, between 96th Street and Atlantic Avenue and between Coney Island-Stillwell Avenue and Prospect Park. The MTA does the repair work, called FASTRACK, to fix tracks and signals, remove debris and repair tunnels.